Abstract: The study discusses the application of the Ti-in-biotite geothermometer of Henry et al. (2005) to the example of biotites from non-graphitic peraluminous micaschists of Central Serbia. Three petrographically different micaschists were distinguished on the basis of the following mineral assemblages: CV1 (St-Grt-Bt-Ms-Pg-Pl-Qtz), CV2 (Grt-St-Ky-Bt-Ms-Pl-Qtz) and RH (Grt-St-Bt-Ms-Pl-Qtz). Applying different geothermobarometers it was estimated that the studied micaschists were metamorphosed at average temperatures and pressures of 530 °C and 520 MPa (CV1incl), 580 °C and 670 MPa (CV1), 630 °C and 700 MPa (CV2) and 550 °C, 680 MPa (RH). The average temperatures obtained by the Ti-in-biotite method revealed uniform values for CV1 and CV2 micaschists and these values are very similar to the temperatures obtained by other methods. In contrast, the application of Ti-in-biotite geothermometer for RH micaschist yields the temperature difference of 85–110 °C. The variability of temperature is interpreted as a result of a positive correlation of Ti contents and XMg values in RH biotite, which is in disagreement with the principles of the Ti-in-biotite method. The positive Ti-XMg correlation is a result of the compositional variability shown by RH biotites from different samples, which can possibly be related to compositional inhomogeneities of the pelitic protolith. On the other hand, the Ti-in-biotite geothermometer for CV2 biotite gave very uniform temperatures despite variable Ti contents (Ti=0.260, sd=0.018 apfu). This is explained as result of the low sensitivity of Ti-in-biotite geothermometer for high Ti concentrations (>0.25 apfu). Abstract: Several plutons located in the southwestern part of the Sredna Gora Zone — Bulgaria are examples of the Apuseni-Banat-Timok-Sredna Gora type of granites emplaced during Late Cretaceous (86–75 Ma) times. The studied intrusive bodies are spatially related to and deformed by the dextral Iskar-Yavoritsa shear zone. The deformation along the shear zone ceased at the time of emplacement of the undeformed Upper Cretaceous Gutsal pluton, which has intruded the Iskar-Yavoritsa mylonites. A clear transition from magmatic foliation to high-, moderate- and low-temperature superimposed foliation and lineation in the vicinity of the Iskar-Yavoritsa and related shear zones gives evidence for simultaneous tectonics and plutonism. Away from the shear zones, the granitoids appear macroscopically isotropic and were investigated using measurements of anisotropy of magnetic susceptibility at 113 stations. The studied samples show magnetic lineation and foliation, in agreement with the magmatic structures observed at a few sites. Typical features of the internal structure of the plutons are several sheet-like mafic bodies accompanied by swarms of mafic microgranular enclaves. Field observations indicate spatial relationships between mafic bodies and shear zones as well as mingling processes in the magma chamber which suggest simultaneous shearing and magma emplacement. Structural investigations as well as anisotropy of magnetic susceptibility (AMS) data attest to the controlling role of the NW-SE trending Iskar-Yavoritsa shear zone and to the syntectonic emplacement of the plutons with deformation in both igneous rocks and their hosts. The tectonic situation may be explained by partitioning of oblique plate convergence into plate-boundary-normal thrusting in the Rhodopes and plate-boundary-parallel transcurrent shearing in the hinterland (Sredna Gora). Abstract: The studied deposits represent the sedimentary cover of ophiolitic melange of the Western Vardar Zone Belt. 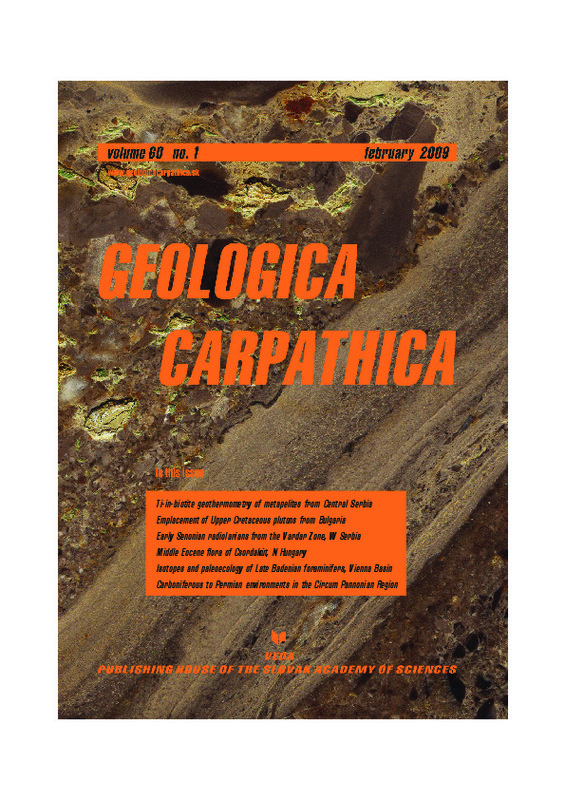 An association of sediments that correspond to a primary pyroclastic material occurs in the Upper Cretaceous carbonate sediments near the village of Struganik (Western Serbia). This is an interlayer within mainly carbonate sediments represented by limestone, clayey limestone and marlstone. It is made of the following succession: a lamina made of crystalline quartz, sanidine, plagioclase and biotite and a layer of clay. The clay is of the smectite type, highly crystalline. The age of the radiolarian assemblage from the clay layer is assigned to Early Senonian, based on the co-occurrence of radiolarian taxa: Dictyomitra formosa Squinabol, Dictyomitra koslovae Foreman, Dictyomitra torquata Foreman, Alievium sp. cf. A. superbum (Squinabol) and Pseudoaulophacus sp. cf. P. venadoensis Pessagno. The pyroclastic material was brought into the water environment by a cloud that was formed after an explosive eruption whose exact location cannot be determined at the moment. According to geological data, there are no indications of volcanic activity before the Late Cretaceous in the wider studied area. Marine sedimentation continued after gravitational differentiation of pyroclastic material. The results of petrological and sedimentological investigations reveal that Struganik Limestone originated in a deep-water environment and that the sedimentation area was on the continental slope. Abstract: The Middle Eocene fossil plant assemblage from Csordakut (N Hungary) comprises plant remains preserved exclusively as impressions. Algae are represented by abundant remains of Characeae, including both vegetative fragments and gyrogonites. Remains of angiosperms comprise Lauraceae (Daphnogene sp. ), Fagaceae (cf. Eotrigonobalanus furcinervis), Ulmaceae (Cedrelospermum div. sp. ), Myricaceae (Myrica sp., Comptonia div. sp. ), Leguminosae (leaves and fruit), Rhamnaceae (?Zizyphus zizyphoides), Elaeocarpaceae (Sloanea nimrodi, Sloanea sp. fruit), Smilacaceae (Smilax div. sp.). The absence of gymnosperms is indicative of a floristic similarity to the coeval floras of Tatabanya (N Hungary) and Girbou in Romania. Sloanea nimrodi (Ettingshausen) Kvacek & Hably, a new element for the Hungarian fossil record indicates a floristic relation to the Late Eocene flora of Kuclin (Bohemia). Abstract: Paleoecological interpretations based on stable isotope study of benthic (Uvigerina semiornata) and planktonic (Globigerina bulloides, Globigerinoides trilobus) foraminiferal shells from the Paratethys Vienna Basin (southwestern Slovakia) are presented. The study was performed on sediments of the Devinska Nova Ves-clay pit deposited during the Middle and Late Badenian (Middle Miocene). Our δ13C data show an enhanced nutrient input to the water column and the organic matter accumulation at the bottom of the Vienna Basin. The remineralization of accumulated organic matter on the sea floor resulted in the formation of oxygen-depleted zones, where no oxic indicators but the oxygen-deficiency tolerant species were found. Positive benthic δ 18O signal can be attributed to the influence of the global cooling recognized in the world-ocean during the Middle Miocene. At the same time, variations observed in the water column are interpreted as reflecting the local temperature and salinity changes resulting from the fluvial and rain inflow. The differences between surface and bottom water temperature reflect the stratification of the water column. Such stratification might be related to the isolation process of Central Paratethys in the Badenian. This study confirms that δ 13C and δ 18O are not always in isotopic equilibrium with the ambient water but are also influenced by vital effects (respiration, symbiont photosynthesis ...). The vital effects led to the incorporation of isotopically light metabolic CO2 into Globigerina bulloides resulting in high similarity between δ 13C values of Uvigerina and Globigerina. It has been shown that the extremely high δ 13C and very low δ 18O of Globigerinoides trilobus clearly imply the influence of algal photosymbionts. Abstract: The Pennsylvanian-Cisuralian late-orogenic and post-orogenic paleoenvironments of the Circum Pannonian Region (CPR) include tectono-stratigraphic sequences developed from the Upper Bashkirian-Moscovian marine early molasse stage up to the Guadalupian-Lopingian post-orogenic stage, with gradual connection to the beginning of the Alpine (Neotethyan) sedimentary cycle. Shallow marine siliciclastic or carbonate siliciclastic overstep sequences started in the internal part of the Variscan orogenic belt during the latest Serpukhovian and Bashkirian–Moscovian. They overlapped unconformably the variably metamorphosed Variscan basement, or weakly deformed and metamorphosed foreland and syn-orogenic flysch sediments of Mississippian to Early Pennsylvanian age. The post-Variscan rifting largely affected the Variscan orogenic belt by reactivation of the Variscan lithosphere. The late- to post-orogenic terrestrial sequences started within the internal part of the Variscan orogenic belt during the Middle/Late Pennsylvanian. It continued gradually to terrestrial-shallow water carbonate-siliciclastic sequences in its external part through the Permian. According to the present configuration, the Alpine (Neotethyan) northward shifting transgression started during the Guadalupian/Lopingian in the South and during the Early Triassic in the North.